Located 14 km from Paris, Paris-Orly airport is mainly used for national and European flights well as for flights to Maghreb, Middle-East, French overseas departments and territories and Canada: Montreal and Quebec. 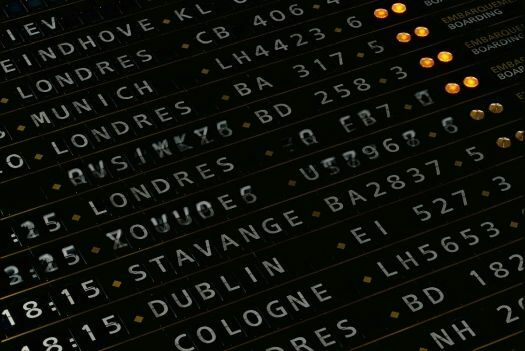 Paris-Orly is the second airport hub in terms of passenger traffic in France after Paris-Charles de Gaulle airport and is also classified as the 10th busiest in Europe. It is divided into two terminals: the South terminal and the West terminal (four halls). The airport has three runways and a cargo terminal as well as a maintenance area. Management of the airport is under the authority of Aéroports de Paris (ADP). Check the map of the airport to know which is the best place to park depending on your terminal. 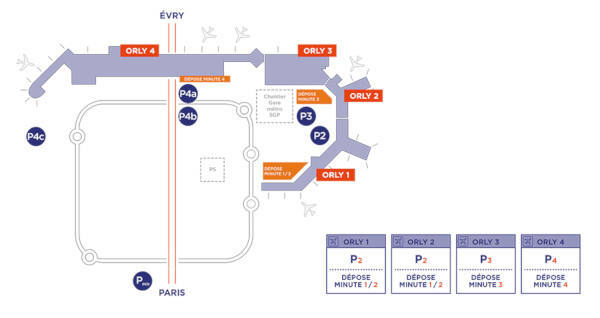 Departure point for the free shuttle service which covers all car parks is located at Orly Sud gate H. It stops at parking P6/Ibis/Gendarmerie-the French national police force, parking P4, parking P7, parking P5, Terminal Orly West and returns back to Terminal Orly Sud. How to get to Orly Airport - public transport? RER B get off at the station “Antony” (direction St Rémy-les-Chevreuses - B4: be careful to take direction B4). At Antony station, take the automatic metro ORLYVAL to Orly airport. Buy a special Orlyval ticket for either Orlybus or “Bus Direct” network. - car Bus Direct line 3 connects both Parisian airports from Paris-Orly airport to Paris-Charles de Gaulle airport. Take tramway line T7 at the station ‘Orly airport’ located at -1 level of Orly Sud terminal in the pedestrian gallery car park P3 Green to go between Villejuif-Louis Aragon (terminus metro line 7) and between the bus and tramway interchange at Athis-Mons. What is the best way to get to Paris from Orly airport ? What to do while waiting for your plane at the airport? Inspiring choices and options for all: space devoted to children, space for quality-comfort-time, light-therapy, massage, multimedia kiosks, duty-free shops, prayer rooms offering a quiet retreat for prayer and meditation, restaurants for all budgets in both terminals. Assistance for people with disabilities is available. A relaxation space has opened entirely devoted to reading in Hall B in the South terminal. This free service allows passengers to read national and foreign press as well as a wide selection of books. How to go to the Stade de France from Orly? You will need to go through Paris from south to north. The fastest way is to use public transportation. Take the Orlyval to Antony then take RER B in direction of CDG Airport and stop at La Plaine Stade de France station. Follow the signposts, it will take you about 10min to get to the Stade de France. The journey lasts 1h. Same travel to get to Paris Nord Villepinte Exhibition Park: take the RER B line and stop at Parc Expo station. If the RER B is out of service, take the tram or bus to reach the closest subway station in Paris then take RER D in direction of Goussainville – Stade de France. Follow the signposts to get to the stadium.